In modern offices and homes, it is quite common to see several devices that utilise power over Ethernet (PoE, 802.3af), such as wireless access points, Internet cameras and voice over IP phones. For a midsize office or a relatively large house, it often requires a gigabit PoE switch to power all these devices. And a 24-port gigabit PoE managed switch is popular among most users. But in the past ten years, some devices are designed to use more power than traditional PoE, which demands the newer PoE+ (802.3at) standard that delivers higher power over an Ethernet cable. So 24-port gigabit PoE+ managed switch is used to power them. 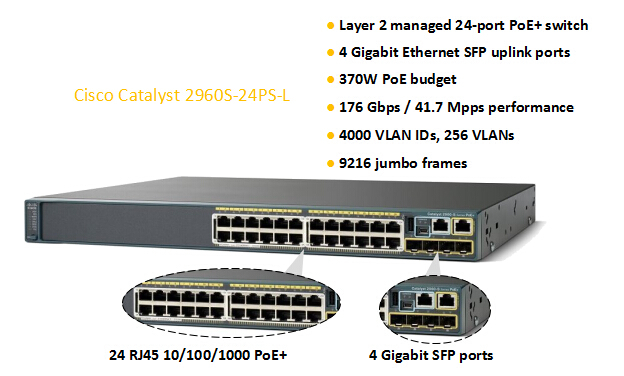 The Cisco Catalyst 2960S-24PS-L is eligible in every aspect when cost is not a problem. In this post, we’re going to find the 24-port gigabit PoE+ managed switch that can replace this network switch in most situations. Cisco WS-C2960S-24PS-L is the 24-port gigabit PoE+ managed switch model of the Catalyst 2960-S series switches. It is a managed layer 2 switch with 24 Ethernet 10/100/1000 PoE+ ports and 4 gigabit Ethernet SFP ports. Its total available PoE power is 370 Watts, which means it can support up to 24 PoE devices or up to 12 PoE+ devices. (To calculate how many PoE/PoE+ devices the switch supports, simply divide the total PoE Budget by 15.4W/30W.) Its switching bandwidth and forwarding rate are 176 Gbps and 41.7 Mpps respectively. Some other parameters that we will take into consideration are VLAN IDs (4000), maximum VLANs (256) and jumbo frames (9216 bytes). It is a fully managed switch that supports WEB GUI, CLI, Telnet, SNMP (v1, v2, v3). Cisco Catalyst 2960s-24PS-L is an excellent 24-port gigabit PoE+ managed switch. Since there are cases when we want to support the same number of PoE/PoE+ devices but do not require a 176Gbps backplane bandwidth, or to cut the budget down as well, we want to find a replacement for this full-managed Cisco 24-port gigabit PoE+ switch. Here are four different 24-port gigabit PoE+ managed switches that have equal numbers of VLAN IDs, maximum VLANs and jumbo frames with Cisco Catalyst 2960s-24PS-L. They are HP 2920-24G-PoE+, Netgear M4100-24G-POE+, Ubiquiti US-24-500W and FS.COM S1600-24T4F. The following table gives some information of them. From the table we can see that the 24 RJ45 ports of these five switches are all 802.3af/at compliant. And each switch is designed with 2/4 gigabit fibre uplink ports. The main differences between them are the switching capacity, forwarding rate and PoE budget. Comparing Cisco WS-C2960S-24PS-L with HP 2920-24G-PoE+, they have similar new device price and identical PoE budget. The HP 24-port gigabit PoE+ managed switch also has a more than 100Gbps switching capacity but much higher forwarding rate than the Cisco 24-port gigabit PoE+ managed switch. They can support the same number of PoE/PoE+ devices. 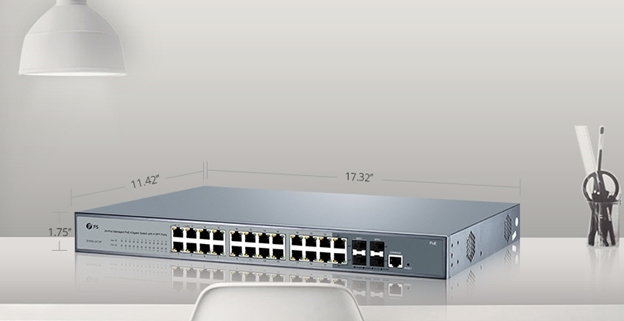 The Netgear M4100-24G-POE+, Ubiquiti US-24-500W and FS.COM S1600-24T4F have much smaller switch fabrics and slightly lower forwarding rates than the Cisco model. M4100-24G-POE+ supports the same number of PoE/PoE+ devices as Cisco Catalyst 2960S-24PS-L. It’s half the price of the Cisco model. But it has the smallest switch fabric and lowest forwarding rate among the five 24-port gigabit PoE+ managed switches. The Ubiquiti US-24-500W and FS.COM S1600-24T4F have higher PoE budget than the other three switch models. So they can support more PoE/PoE+ devices simultaneously. The prices of the last two switch models are the lowest among them. And the 24-port PoE+ gigabit switch S1600-24T4F has the highest total PoE budget in comparison. In this article we intend to find some 24-port gigabit PoE+ managed switches that can be used to replace the Cisco Catalyst 2960S-24PS-L in some situations. If you want to replace it with an equivalent 24-port gigabit PoE+ managed switch but with higher forwarding rate, the HP 2920-24G-PoE+ is a suitable choice. If the switching fabric is not a key requirement and there’s need to pare the budget down, have a look at the Netgear M4100-24G-POE+, Ubiquiti US-24-500W and FS.COM S1600-24T4F. 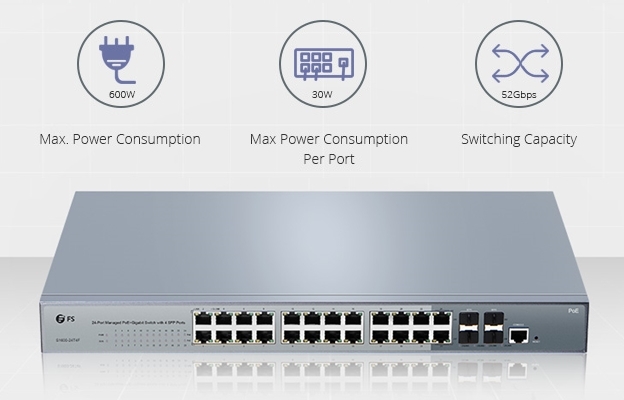 Considering the total PoE/PoE+ devices that will be used in the switch, if more than 12 PoE+ devices are to be connected, the Ubiquiti US-24-500W and FS.COM S1600-24T4F are better options. Related Article: Managed 24 Port PoE Switch: How Can We Benefit From It? This entry was posted in Enterprise Network and tagged 24-port gigabit PoE switch, network switch, PoE+ managed switch on January 4, 2018 by Serenity Huang.